Priceline is one of those sites that we all love to play around on as travelers due to their unique setup and pricing strategy including the ever famous NAME YOUR PRICE. So when it comes time to think about different affiliate programs for your travel niche website or social media platform, priceline is a great option to add. While Priceline isn't the top of mind when you think of travel sites if you compare it to Agoda, Booking.com, and the others, but I want to still review it because even until now Priceline often has some of the best deals on travel packages, cruises, budget packages and getting great deals with the name your price program they offer. There were no qualifications to sign up for their affiliate program, however, you do need to be signed up on CJ Affiliate Network which is a 3rd party company that manages Priceline's affiliate program. If you're not familiar with affiliate programs, they are setup to help each company advertise by allowing “partners” like us advertise on our websites. As a benefit to us, they give a small commission of the sales that happen from customers who end up booking through the links you publish. Below i'll go through much more detail about the program so you can decide if it's right for you. What Type Of Products Are Featured on Priceline? Hotels: With Priceline being part of the chain Booking Holidings who is the worlds leader in online travel services, when you search hotels on Priceline it compares the hotels on other big-name sites like Agoda, Booking.com, Kayak, and others to get you the best prices on your next hotel or apartment. Cars: When you're looking to rent a car, going through Priceline gets you all of the competitor rental services all in one including companies like Avis, Alamo, Budget, Hertz, National, Enterprise, and many more. The great thing is you can pick up the car from one city and drop it off in the next. Flights: Why not book it all in one place while you're at it. Priceline offers incredible deals on flights around the world partnering with all of the top airlines and most of the smaller country-specific airlines as well. Cruises: Cruise line deals are hard to come by but I just loved browsing through all of the amazing cruises around the world. They have it easily sorted by either the cruise-line company, destination, theme, and luxury types so it made it really easy to find the different types. Packages: Getting the best deal is important and so is having a convenient way to book it. Priceline has many great packages on popular destinations around the world that combine your flight, accommodation and attractions all in one for you. Are you looking to take your family to Disney? Well this is the perfect place to get your flights, hotel, and discounted Disney tickets all in one. Name Your Price: This is the Priceline unique tool that I haven't seen on other sites. Consider it the “eBay” of hotels. If you're looking to travel somewhere and you want to stay in a five-star resort but dont want to pay the insane prices, you can offer to “Name Your Price”. You simply inform Priceline of the area you want to stay in, the type of hotel you want (star rating, inclusions, etc) and if Priceline is able to match those they will book a hotel of their choice with your price. Often hotels will accept the lower rates if they have a large amount of vacancies so they can fill the hotel. One of the really surprising things about Priceline was their customer support team. At anytime if you get stumped they have chat support ready to answer any questions for you. Unlike most websites that either dont have the ability to get support or they hide the button 50 steps in after you answer a million questions 🙂 Good job Priceline for treating customers as a priority! Priceline offers different commission rates which range between 3-5% depending on which type of offering a customer purchases. For Vacation Packages, Hotel *Express deals, Cruise trips, Name Your Own Price, Car Rental *Express deals, and Flight *Express, Priceline offers a 3% commission to all completed bookings. For all Retail Hotel bookings Priceline offers a 5% commission on completed bookings. 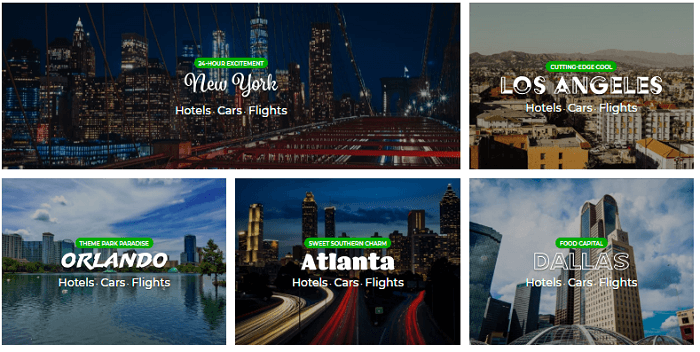 Retail Flights you'll receive a $4 USD flat commission on all completed bookings. *Express deals are those in which you dont get to select the actual hotel, flight, or car but rather you take the deal offered which can be up to 60% off the normal price. It removes the choices but is often much cheaper. Priceline's commission is fairly standard as most of the affiliate programs offer a similar percentage commission on either hotels, flights, or car rentals. Although since Priceline is managed by CJ affiliate, they dont offer any bonuses or increasing commission rates as you drive more volume. Their rates stay static whether you have 1 or 100 bookings each month. Both Booking.com and Agoda are excellent alternative affiliate programs which have very similar offerings and commissions. Booking.com is one of the worlds most widely used vacation booking tools on the web today and offer a different commission type in that you receive a % of the profit that Booking.com gets. This starts at 25% and ranges up to 40% as you increase in completed bookings. Note, this is not a commission off the booking amount but rather the profits only. Agoda.com is also a great program. Agoda has one of the easiest sites to use and offers really great flash deals on hotels. I also found that their mobile app is one of the easiest to use. I can often complete a booking within 30 seconds. They offer a commission between 4-7% on all bookings starting on the low end and as you start to drive higher volume it increases. If you want additional ideas for alternative affiliate programs which you can partner with this, you can look into different travel insurance programs that offer affiliate commission. As well you can utilize Amazon for your favorite travel gear whether that be clothing, camping items, cameras, and any other travel related items. Travel blogs are some of the best pairs for Priceline to have. Travel blogs are one of the most effective ways of sharing the best travel locations and attractions with the world. Every traveler needs the necessities that Priceline offers including hotels, flights, transportation, etc. Adding priceline's banners or sales to your site helps to promote their products. Can You Make Money With The Priceline Affiliate Program? There's many ways to make money with Priceline as an affiliate partner, so lets take some time to review how thats done. First thing you need to do in order to start making money is to sign up with Priceline. Once signed up, search for Priceline in the Advertisers list. You will have to wait until you are approved to utilize their program. Once approved, go to your advertiser list and you'll see the Priceline program information. To see the terms and commission rates simply click on the “Program Terms” link. To utilize the affiliate tools you have two options: “Get Links” and “Get Products”. I'll review each of these below. If you click the “Get Links” button, it will show you all of Priceline's banners and text links available including the duration of each (if there is an end date). There are plenty to choose from depending on the theme of your website. They also offer many different text links for the same deals. Each of the links automatically are linked up to your affiliate account so if any bookings are made you receive credit for it. Under the “Get Products” button are links to every hotel available under Priceline. These links can be used to allow you to advertise specific hotels by adding hyperlinks to your site. This is a great way for you to make suggestions on hotel choices based on your experiences. Each of these URLs are also linked to your account. If they book that hotel or any other hotel you will receive the commission from it. With over a million listings available, there are endless possibilities for earning commissions. The commission is comparable to other affiliate programs ranging from 3-5%. With any travel affiliate site, the competition is steep. Many sites are doing the same thing that Priceline is doing so in order to attract customers you have to be very strategic to draw in customers. No bonuses or increases in commission as you drive high-volume traffic.